Over the past week, ESA's Integral satellite has been observing an exceptional outburst of high-energy light produced by a black hole that is devouring material from its stellar companion. 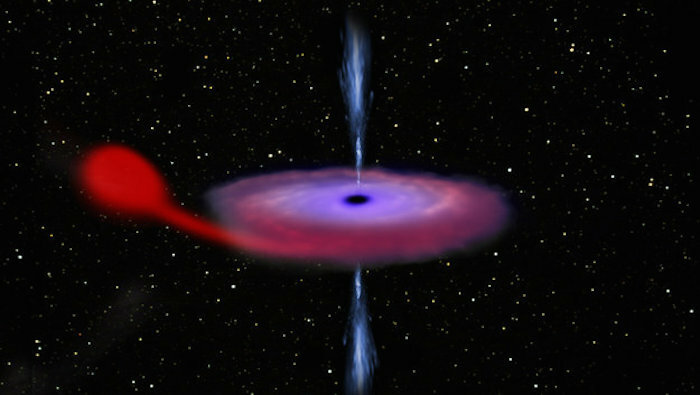 On 15 June 2015, a long-time acquaintance of X-ray and gamma ray astronomers made its comeback to the cosmic stage: V404 Cygni, a system comprising a black hole and a star orbiting one another. It is located in our Milky Way galaxy, almost 8000 light-years away in the constellation Cygnus, the Swan. In this type of binary system, material flows from the star towards the black hole and gathers in a disc, where it is heated up, shining brightly at optical, ultraviolet and X-ray wavelengths before spiralling into the black hole. First signs of renewed activity in V404 Cygni were spotted by the Burst Alert Telescope on NASA's Swift satellite, detecting a sudden burst of gamma rays, and then triggering observations with its X-ray telescope. Soon after, MAXI (Monitor of All-sky X-ray Image), part of the Japanese Experiment Module on the International Space Station, observed an X-ray flare from the same patch of the sky. These first detections triggered a massive campaign of observations from ground-based telescopes and from space-based observatories, to monitor V404 Cygni at many different wavelengths across the electromagnetic spectrum. As part of this worldwide effort, ESA's Integral gamma-ray observatory started monitoring the out-bursting black hole on 17 June. “The behaviour of this source is extraordinary at the moment, with repeated bright flashes of light on time scales shorter than an hour, something rarely seen in other black hole systems,” comments Erik Kuulkers, Integral project scientist at ESA. “The community couldn't be more thrilled: many of us weren't yet professional astronomers back then, and the instruments and facilities available at the time can’t compare with the fleet of space telescopes and the vast network of ground-based observatories we can use today. It is definitely a 'once in a professional lifetime' opportunity,” adds Kuulkers.